A little while ago I had a conversation about snakes in France with my friend Jane (Australian, lives in the UK, owns a house in France - there's dozens of us, you know). It occurred to me that this was quite a good post for the blog, so here is some information on snakes in France. There are about a dozen species of snake in France but only two (or in the south, three) species in France are really venomous - these are the Vipers or Adders. (To be absolutely accurate, one species of grass snake is venomous too, but because of the way its fangs are positioned, could not physically get enough poison into a person to do any lasting damage.) For comparison, there are 3 species of snake in the British Isles (one poisonous), and Australia has about 140 species of terrestrial snakes and 32 marine species. About 100 Australian species are venomous. Vipers and Adders can be identified most reliably by their slit shaped pupils, but are also usually less than 50cm long, grey or reddish brown with a black zigzag pattern down the back. They are quite venomous, but almost never fatal. If bitten by any snake, the most important thing is to stay calm and get to a hospital. You will probably know if the bite is poisonous fairly quickly, as the area around the bite will hurt like hell and swell alarmingly. If you or a companion are feeling particularly cool, calm and collected (as if!) photograph the snake, to help ID it at the hospital. I don't suggest trying to catch it or kill it - you risk being bitten again, and anyway, all snake species in France are protected. Having said all that, snakes are not normally agressive, except in the breeding season (early spring). A Western Whip Snake Coluber viridiflavus (Couleuvre verte et jaune), taken in the Charente at our friend Bas's place. It had come to drink at a roadside ditch in a hamlet. Many visitors to France will never see a snake, but if you do want to see them, water bodies such as ponds and ditches are a real draw, as are buildings infested with mice. Snakes like cool quiet dark places as much as sunny spots. That's why finding them in laundries is not uncommon - a room with a door to the outside, with a cool tiled floor, not in constant use, and with a lovely dark quiet retreat under the tub or washing machine. My personal experience in France is that you would only ever meet a snake in a rural area. I've only seen a few, either on the road (usually road kill) or at ditches and puddles coming to drink. All of these have been grass snakes (couleuvre) of some sort, so not really venomous. 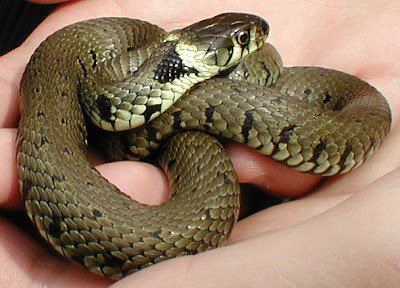 You can pick up grass snakes and handle them quite safely generally so long as you are calm with them, but it is not considered good practice to do so unless you are studying them in a serious way, and anyway, you may not find the experience very pleasant. They exude a rather disgusting musk gunk which you will get all over your hands - the smell lasts for hours no matter how much you wash.
Snakes are extraordinarily cryptic (which is the techie term for well camouflaged). They choose their basking places with great care, and unless you are really tuned in or very lucky, you just won't see them. They will also just disappear under the leaf litter or a log in less than the blink of an eye if they hear anything approaching. They will hear you long before you see them. If you are surveying for reptiles you need to be already familiar with the site so you know where the likely basking spots are, and you need to check them out with binoculars from a fair distance if you are going to get any real idea of the snake population on a site. We've seen only a couple of snakes in the five years we have lived in the country outside Saint-Aignan. One was probably a meter long, so it certainly wasn't venomous, according to your information. It was our old dog that found it actually, but I got a fairly good look at it. Last year Walt saw a snake out in the back corner of our garden. A few days later, I took the roto-tiller out and tilled up that corner. Half way through the job, I realized I had run over the snake. It's head was chopped off, so I don't know it if its eyes were slits. It was silver, and it appeared to be less than 50 cm long. Our neighbors say they have seen many couleuvres and a few vipers in the years they have been spending summers here. Your snake record is pretty average and what I would expect. Difficult to say what your unfortunate headless snake was - if there was no obvious pattern, then likely to be a young grass snake of some sort, but sometimes vipers can be very pale and the pattern very faint. Hehe, I bet that got your adrenalin fizzing :) Your description makes me wonder if it was an escaped pet, like a carpet snake or boa constrictor, but I'm not really sure what you would consider a big snake. Snakes are a bit partial to the engine bays of parked cars as they are protected spaces, and warm, either through recent use or solar gain. Just don't ever do your snake hurling act in Australia - in France a large snake is most unlikely to be venomous, but in Australia, more than likely to be very poisonous. We live out in the countryside in Tarn et Garonne, France and have several snakes in our garden. They like to live under our shrubs near the pool and we were fascinated one day to find two coiled around each other presumably mating. They were about 4ft long and were so wrapped up in each other they didn't take any notice of us. We feel quite priveledged to have them here, as they keep the mice down. What a marvelous sighting for you! It does sound like a mating pair, and the mating season is the only time snakes will completely disregard humans as they are focused on more important things. We live in a small Alsacian village of Kembs, near the border of Germany, France, and Switzeland. Yesterday, I ventured behind our garden fence that separates our property from the Water Department of Kembs. I was attempting to trim down weeds and remove wood planks from that area. Upon removal of the second plank(luckily I had removed it with a long stick), I saw a brown snake about 12 inches long. Initially, it remained motionless, as did I. When I peered to view if the eyes were vertical, the snake flicked its tongue twice.... I then retreated backwards. I yelled for my neighbor who was working in his garden, but before he could get to me, the snake had slithered through the grass, under the fence and in the direction of our garden. The snake was brown, and just a bit shiny,.... near the underbelly was a black stripe the entirety of its body. Last July, I was trimming the grass around our "encased in stone" melissa garden, and a black snake with a yellow stripe from head to tail, wriggled away under a stone. I was unable to see the eyes as it slithered away so fast. My neighbor´s cat found one viper(black) on their property a few years back. Also, a fabulous green and yellow lizard sashayed onto our summer garden deck a few weeks back. I was even able to take a picture. Are there snake avert devices that I could install into the garden? Anna - it's impossible to be sure what sort of snakes you are describing. I think it is possible that the first snake was an adder/viper/asp (essentially just different names for the same family of snakes) and the second probably some sort of grass snake. Most snakes in France are not poisonous, and the 2 (or 3) species that are will not kill an adult, although they could kill a cat or small dog and make a small child pretty sick. I would suggest you wear gloves and rubber boots if you are doing things like lifting planks of wood - this is a very common way of coming upon a snake suddenly. They like to hide under planks and other debris as it will be warm but sheltered. I don't know of any snake detection unit that you could install. Rely rather on the fact that they will hear you long before you see them usually, and will slide off. Remember they are much more frightened of you than you are of them. They will only bite in the most exceptional circumstances, although even non-poisonous grass snakes will put on quite a show of hissing and striking if they are frightened. The big green lizards are not dangerous, although they are capable of delivering a painful bite that will probably get infected. They won't attack you unless you attempt to pick them up or something like that they feel threatened by. We live in the Tarn et Garonne, near Toulouse. Been here for 6-7 years and most years (being in the countryside) we see snakes. We have a large pond (more like a small lake) and so large grass snakes are common. The presence of the dogs has kept them away from the front of the house the last 2 years. However this year we have seen two snakes not seen before. The first must have been .7-.9 M's long and was a redish colour and quite thick. The other was quite small, I would say 20-30cm roughly (didnt see the head) and was brown (no markings) and thin. I think the latter was much too big for a slow worm but as it's small, brown and think it's probably a viper (which with children around is not what we want). Emma – it's hard to say from your descriptions what your snakes might be. I would say that your large snake, if it had no distinctive black zigzag pattern, might be either an Aesculapian, a Smooth or a Montpelliers Snake. Of these, only Montpelliers is poisonous, but it is a rear fanged snake and as such can't bite a person effectively and there have been no fatalities recorded in Europe. Your smaller snake sounds unlikely to be an viper, but more likely to be a young grass snake of some sort – perhaps a Western Whip Snake, which in my experience are by far the most commonly seen snakes in France. When young they are not strongly marked, except sometimes on the head, and they are thin. See our post about the one we had in the house – http://daysontheclaise.blogspot.com/2008/06/surprise-visit.html. A viper/adder of 20-30cm would be thicker in proportion to its length. I am living close to Amelie les Bains In the Pyrenees. Since spring I have Had around 10 snake sightings, three of those being Vipers. If I have seen 10 ten out In the open, I am wondering how many I am missing. Becoming paranoid about them , really worry about my Jack russell terrier, he has his nose In every nook and cranny . Linda - dogs like terriers might indeed surprise the occasional snake, but they are also smart, and will back off pretty quickly when the snake threatens them. The snake will always issue a warning before it bites, and most dogs retreat when hissed at. I suggest you talk to you local vet to see what s/he thinks the real risk is; ask if dogs in the area are bitten very often; and if so, are they just made a bit sick for a few days, or is it actually fatal. Personally, I think that your dog has survived the year unhurt, which probably means that he has come to an understanding with the snakes and will be fine. Thanks for posting this. 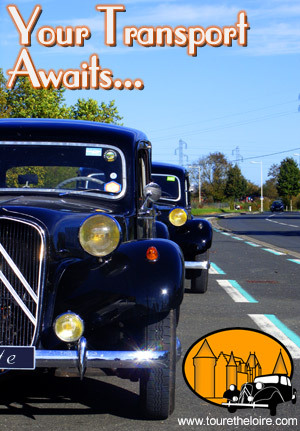 We live about and hour southwest of Toulouse. Our cat is constantly bringing snakes into the house to play with. The snake of the day for today was one of the grass snakes. Thanks to your great photo, I ended up here. Keith: Glad we could help. I'm glad I stumbled across this page as I have been trying and failing to find out which type of snake my dad found in his conservatory. He lives in rural brittany and has permanent residence there. The other day he saw a snake in his conservatory (catching some rays, i assume) that he described as 'like looking at pure gold, with gold eyes too'. At first I thought he was having me on, or at least eggagerating, but he insisted the snake had no other markings and looked a golden yellow. We are assuming it was a baby as it was about the width of a pencil and about 10 inches long. Stupidly, he didn't think to take a photo and gently brushed the snake into a dustbin brush before putting it back in the garden. Via research the only thing I came across was the 'yellow asp viper' which interetingly does completely fit his description yet I have no idea if it lives in france. Does anyone have any ideas? Help much appreciated as we are both very intrigued! P.s My first instinct was an escaped pet such as a corn snake but we have only 2 or 3 neighbours and im sure they dont keep pets like that! Other than that, nobody really lives anywhere near us. Roz: My first thought is that it was a slow worm, although its presence in a conservatory would be rather unusual. A young Smooth Snake would be my second thought. Many snakes have golden eyes, and there will be quite a few juvenile snakes of all sorts around at the moment. Young snakes and adults that have recently shed their old skin can be extremely shiny and give a metallic appearance. Even within the same species, markings vary quite a bit and can be very faint. Your father's choice of species in Brittany is: Smooth Snake, Grass Snake, Adder (common viper) or slow worm (actually a legless lizard). Yellow Asp Viper is a subspecies of the Asp Viper, and does not occur in Brittany. Well done to your dad for being gentle with it. I'd like some help with two Western Whip snakes which appear to have taken up residence in our garden in the Charente France. Each time we've seen them it's been because the dogs (they're only small collie sized) have discovered them and they usually climb up a tree or shrub to hide (there's one in the lilac as I write). We have ( a neccesity) a log-pile and a log-shed and I suspect they're making use of that, but I've also seen them basking near the compost heap. I know they'll make themselves scarce if disturbed, but the dogs are so insistent (and cautious) that I'm concerned about any harm such a snake could inflict on them if they got too close or cornered one (or both) of them. Anon: it would be extremely unlikely that the snakes and dogs could get into a situation where the dogs could be harmed by the snakes. Although it's recently been discovered that Western Whip Snakes do produce venom, they have no means of injecting it. They will bite if cornered, and it will hurt, but cannot poison. The snakes will hiss and look ferocious if cornered. If your dogs are not sure of themselves with the snakes they will be scared of that and stay out of reach. Pegi: Good heavens! What a great story! Please tell us more - you can email me via my profile link over on the right. The only venomous snake your uncle would have picked up in Normandy is the Adder Vipera berus. Hi Susan, I was near a pond today, some where around Avignon and saw the body of a snake, light brown with sporadic diamond shaped spots on its body, diving around like an eel among the rocks. So used to snakes from where I was from (tropics) always curious about the species here in Europe. Can't find a photo online about it, any chance you know? FTWP: Quite likely it was a grass snake. They can be variable in their markings, and swim very readily. Frogs are their favourite meal. For the second time in a couple of weeks, just found one half of a small snake, still moving after falling victim to my sit-on mower. We are in the Loire Valley and have a large pond and the grass had got to waist high in parts in our absence. We leave it long at the edge of the pond bank for the grass snakes which are big but of course harmless. The ones I have unfortunately killed with the nowing blade look slimmer than my little finger and completer would be around or less than two feet in length I reckon. The top back looks black and the belly more of a fawn colour than anything else. 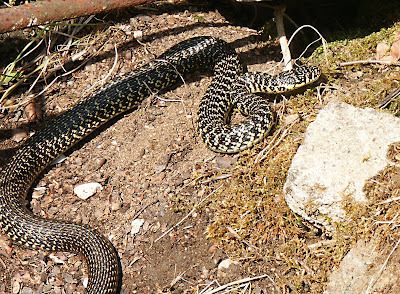 Couldn't find the head half for a better ID, but my neighbour says they are asps drawn to the water in the dry seasaon, and more venemous than adders. But I guess he would say that with relish, being a French countrymnan talking to a townie born and bred Brit. ANy suggestions, pse? I can take a photo of the bottom half. George: Your neighbour is right that asp vipers are slightly more poisonous than adders, however, your description does not sound like a typical asp viper to me. More like a small mature Aesculapian snake. It's always difficult to ID snakes from descriptions, and most species are quite variable, so send me a photo and I try to give you a more definite ID. You can contact us via our profiles (link on the side bar). Came across 3 snakes today in a river in the Ardeche. Quite slow moving water. The first was about 2 feet long and made off before I could get a good look. Then came across 2 young on different occasions under water. Carefully caught one in a net to get a closer look. Quite exceptional, especially for the first day's exploration! Philip: Wow! What good luck. Did you come to any conclusions about what species they were? What an interesting web page !!! I'm not a great lover of snakes. My wife and I were river walking along the Cezes last week and came across a snake coiled up in the bottom of a shallow pool. It wasn't for budging when we got close. It sat under the water for ages. Didn't knwo they could do without air for so long. Alex: What an interesting sighting! Many snakes are excellent and willing swimmers. Perhaps it thought you couldn't see it under water. Hello again. I identified one of the snakes I found from the photographs we took. It's a natrix maura, or viperine water snake. I think it must have been quite young as it was only about 30cm long. Since then I have seen another 2 along the same river. Maybe because the water is low and there is less and less open water, their numbers are concentrated which makes them easier to find. Philip: snakes are often more visible in dry conditions, so you are probably right. According to Daniel Phillips, Viperines reach maturity at c.30cm and they are on average 40cm long. Just interested about it, and wondered whether you might have any tips about it? Dan: a 10cm pencil slim snake with a white ring round its neck sounds like a young Grass Snake. They are quite variable in colour, but the pale 'collar' is always there, even if incomplete. What a shock, sitting by the pool around 7pm, in Chateau Sadillac, when two grey snakes 3ft long suddenly appeared up through the decking, standing very tall ...from England and not familiar with snakes moved quickly away, but from a distance saw them seemingly dancing together, coiled together, and tall, before after 8 minutes or so disappearing below !!! Needless to say am now reading inside with a large glass of red! Stella: Yes, that would have been a bit alarming! Since it isn't the mating season I would guess that they were fighting (maybe over territory). JC: The best I can do is just guessing, based on the clues you have provided.The chances are that it they were the same species and that they were grass snakes of some sort (therefore not venomous). By far the most common snake people encounter, especially if it is inside, is the Western Whip Snake (not venomous, but can be feisty). They are not really black, but can be quite dark, and don't always have very visible spots. The best advice I can offer is to stamp your feet (so the snake is very aware of you and will move away) and walk in the opposite direction if you see a snake in the wild, do the same and leave the door open if it is inside. Try to get someone to herd it outside if it hides under the furniture. JC: I think it is unlikely it has moved into your house unless you also have a rodent problem (i.e. prey it can hunt). JC: Well it's true that snakes, and Western Whip Snakes in particular are notorious remote hoggers, so you might find the competition trying. I'll see if I can find out what sort of programmes they like to watch, because if your tastes coincide that will make life easier. As a rule of thumb, the more you are there, the less the snakes will be. They will go into hibernation in the autumn and emerge in the spring, so you've got all winter without them. They will be attracted to your garden and buildings if you have a plentiful supply of rodents or if it is dry and they are looking for water. Hi, I saw a snake swimming in the shallows of the dordogne last year. It was about 30cm in length, very thin and yellow & white in colour. I have been told by a few friends that it was poisonous. Any idea what it might have been? Tim: So your friends could tell you it was 'poisonous' but not what species it was? Hmmmm - not sure how that works...The only suggestion I have is maybe a juvenile Western Whip Snake - they can be quite pale. They are not venomous. unfortunately my french is not good enough to understand snake species just yet, so I was unsure about what the species was. Someone did think it might have been a water viper, but no photo's i have found look anything like the one I saw. It's head was quite wide, almost twice the width of it's body. Similar markings of a carpet python, (which it obviously was not) but yellow and white and obviously a great deal smaller. Still sound like a western whip? p.s. thanks for taking the time to reply, much appreciated, has been bugging me for a while. Tim: Your description of the head sounds like an Asp Viper, which are venomous. However, they have a pattern of black bands down the body which often form a sort of irregular zigzag. They can be pale grey or brown, but not white or yellow as far as I know. Carpet pythons have a sort of camouflage pattern and no French snake I can think of has this. They are either plain, spotted, banded or zigzagged. No French snake I can think of is entirely yellow and white, although occasionally you can get orange and cream. Water vipers are not native to France. I wonder if your friends meant the Viperine Snake Natrix maura (not venomous, but highly aquatic). I think your snake is going to stay a mystery unfortunately. Hi. I am just about to love to rural Montagne Noir territory (in between Toulouse and Bezier), at a property with large grounds, a couple of lakes and streams. Neither the house or the groundas have been much in use for the last 10 years, and will need renovation/landscaping (lots of tree work, and strimming round the lakes, etc). From reading these posts it would seem I can expect to encounter a lot of snakes?! Which is a shame, as I definitely have a phobia (a word I haven't seen on this site yet, strangely). In fact, looking round the house I already saw 3 very small (circa 10 cm) thin black - and I'm pleased to say, but appreciate you may feel less happy - dead ones. The small dead ones in the house worry me. Am I going to be finding quite a few, do you think? - If swimming in the lake is it possible to swim into a snake, and if so could it be any type of snake, including venemous. How od they behave in water - and what is the best reaction to coming close to one (which I'd love to hear you say is highly UNlikely)? - Are they generally to be found in trees, as well as the other places discussed on this site. There is a lot of tree work to be undertaken - including cutting down and back quite a few. - Is there anything that can be done to minnimise their prevalence in the grounds, and certainly in or close to the house? Sonic stuff, etc? - It appears all snakes are protected? So, they cannot be harmed? Why are they protected - given that theu sound so common, can be venemous, etc? - What is the besy way to proceed to enter outbuildings that need clearing, or to cut back gardens that are overgrown, or to move log piles, etc?? Sorry for the flurry of question - and sorry not to be a snake lover, as I appreciate you and many readers are. But It's a pretty genuine phobia, and I would love to reduce my encounters to an absolute minimum. Chris: My guess is that you will see a couple of snakes a year. Maybe a few more in the first summer of occupation. Snakes do occasionally come inside. It is likely to happen much less, if at all, if the house is occupied. If you have a rodent problem snakes may enter roof spaces and outbuildings to hunt. Several species of snake in France hunt in the water. None are venomous and it is very unlikely that you would encounter them face to face in the water. They would be too busy swimming away from you. The snake is not interested in you, but sees you as a threat. Simply move as calmly as possible in the opposite direction and it will do the same. Some snakes will climb small trees and bushes to hunt. The same rules apply as in the water, although they are more likely to hiss a warning from a tree. Most snakes have plenty of bluff and bluster, but only if they are surprised. Just by occupying the place you will discourage the snakes. They won't want to come anywhere near you. In the early days, stomp around heavily in places you are nervous in and generally make a lot of noise. They will hate that and be frightened and move away quickly. Resident dogs and cats will also frighten them off. Snakes are protected because they are not common any more. I'm not sure where you got the idea they are common. Most people never or rarely see them. Only 3 species in France are venomous and these species are even rarer and more secretive than the non-venomous ones. It's been decades since anyone died from snakebite in France (not since the invention of anti-venom). Do not take too much notice of what your French neighbours tell you. A lot of it will be ignorant nonsense, some of it will be an attempt to wind you up, much of it will be well-meaning but coloured by their own phobia. Remember you have 6 months of the year when snakes are hibernating, so you won't see them. If you don't want them to hibernate near you, don't leave piles of organic materials in isolated places, undisturbed over the winter. Just got back from our place in the Montagnes de Bourbonnais,(Allier) 1000 metres up, but quite hot. After an afternoon mowing the grass, I returned to move the mower, and there was a snake under it. About 35cm long, thin, with a pale grey-brown back, and a thin black line down the middle, grey-black sides. I went back to warn the wife, and it had disappeared, (the snake, not the wife!) so my neighbour gave me some 'Alkali' to sprinkle around the stone work. They do bother me, and I am always inclined to do as my neighbour does, and bash them with a spade. Thanks for your response Susan, which is very helpful, as per everything I've seen on your site. What month is hibernation time for snakes generally. And, does hibernation mean some kind of 'nest', with a family of snakes, or do they hibernate individually? If distrubed during hibernation what's the score? Do they immediately awake and start their hissing fun and games, etc?? I do have a lot of clearance to do over the winter months, including the kind of things that appear to be their favoured places of abode, such as log piles near houses, overgrown garden areas, etc. Just come back from a holiday in the Pyrenees. I was wandering down the Ariege in Ax-les-Thermes when I came across a short(30-50cm) snake, some of it was under a rock, sat in the shallows with a small fish in its mouth. I must confess that I am absolutely terrified of snakes so I made a quick get away. It was a browny, reddish colour and seemed to have bands of brown/red colours. Have you any ideas what it might be? Sammy: most likely a Viperine Snake Natrix maura. Moyra: Much more likely to be Viperine Snakes Natrix maura. They like water and look like vipers but are not venomous. Hi Susan, very interesting page. Just wondered if you recognise a snake we saw in the Dordogne just near La Roque-Gageac last week. From your comments above I'm assuming it is a Natrix maura. Managed to catch the couple of photos I've put on Flickr below. Rob: yes, lovely shots of a Viperine Snake N. maura. Quite a number of years ago my wife and I were visiting the South of France While walking on a trail on a hill overlooking the ocean we encountered a large yellow snake. It appeared to me that its motion was that of a Sidewinder. I would estimate its length to be anywhere between eight and 10 feet and its thickness to be about four or 5 inches. We were quite a distance from it and were not able to get close enough to take a photograph before it disappeared into the underbrush. I've done several searches on the Internet of snakes of Southern France and have yet to see one that comes close the one we witnessed that day. If you have any suggestions on what it might have been I would appreciate it. As I said is quite large, seem to move in a Sidewinder fashion, and was a fleshy yellow color. Many thanks, David Gerrior, Victoria, BC. I was in the garden of a friend's house with adjoining woodland, on a steep hill. My Staffordshire was rummaging in the undergrowth. He must have disturbed the large, hissing, green with a yellow underside, snake. From all the information I've found, it seems to have been a Montpellier. A mystery to me as I'm in the Gers (32), a long way from it's habitat. What else could it have been? It must have been getting on for 2 meters long. Aesculapian Snake? Western Whip Snake? A huge snake was standing up to my office window in France just staring curiously at me sitting behind a desktop. She was smiling, so I waved my hand to her. I may let her inside the house and feed some milk as she most likely not poisonous. Been in France full-time 4 yrs now and handled 7 Snakes so far with 5 being only the other day when removing an old concrete floor. I rehome them to the neighbours woods by a rock pile. All been (I believe ) common western whip snakes. We did have one viper come in the lounge one year but I did not handle that. I in the Charente-Maritime . We live in Normandy and never see anything more worrying than grass snakes and slow worms. But a visitor from a neighbouring village told me today that she has encountered some kind of constricting snake( it was wrapped around her cat at the time) I'm inclined to think she has a vivid imagination. What do you think? I would say that the cat had caught the snake and it was trying to escape.